Alfredo Sauce Makes This Recipe Fantastic! 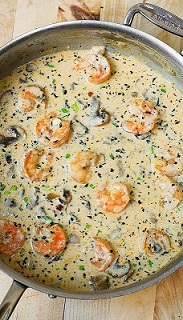 Restaurant customers love this Shrimp Recipe with the modified Alfredo sauce structure and taste. 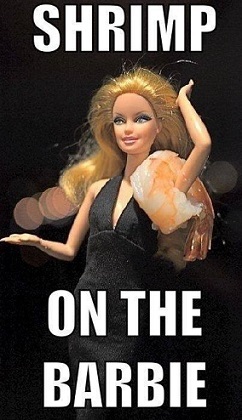 Actually the customers enjoy shrimp (or prawns) cooked in many different ways. 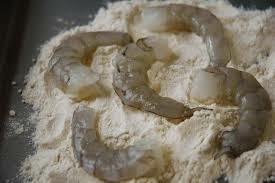 They are ready to "fall upon shrimp" whenever they can get them prepared properly with a trustworthy recipe. Shrimp provides a great deal of flexibility for recipes and restaurant menu development as a main entrée, in combination with other products and as an appetizer. People, and now restaurants, frequently buy shrimp already peeled and deveined. Not to do so means you (or the business) must spend the time (labor) to do the task. For the difference in price, it is no longer worthwhile. Just buy "P & D" shrimp with the tails on. This recipe creates a classic Alfredo sauce and then coats the shrimp with flour in order to thicken the sauce. This makes it easy to serve these shrimp buffet-style, as well as individually plated. 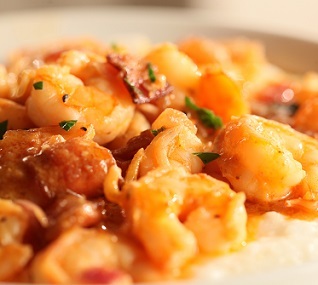 Note: For those folks who are counting carbs, the shrimp recipe is about 16.41 carbs per serving, assuming 4 servings. Preparation time: 20 minutes. 4 servings. Cook prawns 8-12 at a time or in two skillets following this method for each "batch:"
Arrange in individual dishes and garnish with fresh chopped parsley. For a buffet, arrange the prawns in a chafing dish to keep hot and also garnish with parsley. Serve these delicious shrimp with Parmesan Green Beans (15. 17 grams of carbohydrates), or fresh baby green beans (about 8 carbs) or stir-fried vegetables (about 11.3 carbs). All delicious and nutritious! Enjoy your shrimp recipe and the company of those you share it with! Try all the real restaurant recipes on this website! These are recipes that really work!